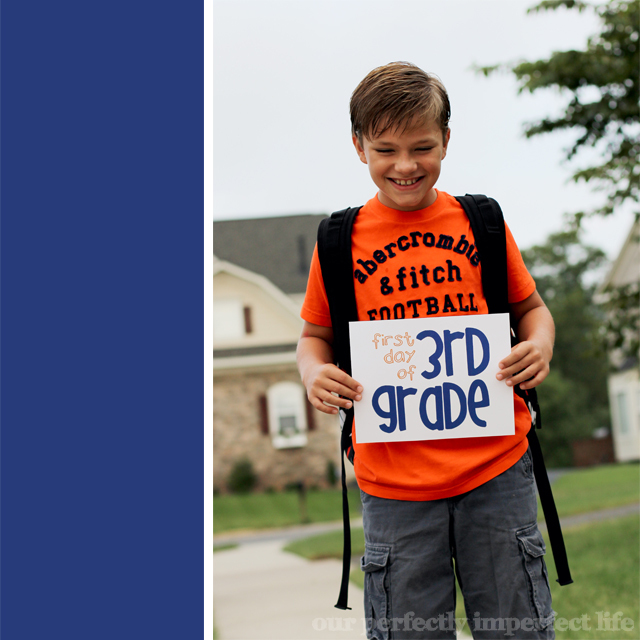 our perfectly imperfect life: First day. The first day of school has come and gone... and I didn't even cry. A shock, I know. Last year I was a hot mess trudging into the unknown with Payton going to kindergarten. This year, I knew exactly what to expect and it was easy peasy sending the girls to school. And poor Mason... I say girls because it is with their special needs that all my anxiety over school comes. I was talking to a friend last night and she told me she was a hot mess yesterday morning thinking not so much about Nika going to kindergarten... but rather the amazing opportunities Nika has been given in life, versus rotting away in a Russian orphanage. She said she kept thinking about where Nika would be today if we hadn't adopted her... and she is so right. It is this very thing that also sends my emotions into overdrive. 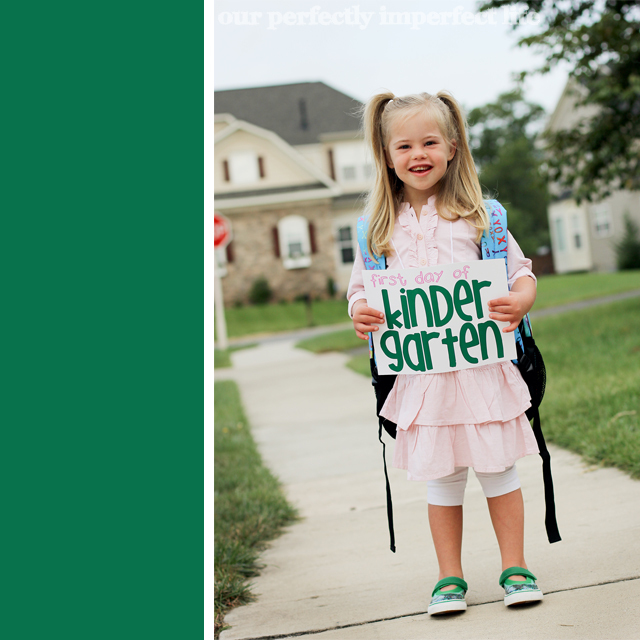 But sending her to kindergarten... I have actually been so excited for her to start and follow in her sister's footsteps. She had an amazing foundation to her education built by her equally amazing preschool teachers... and I know she can rock this. I just know it. Her placement... Nika is in a full-day kindergarten classroom with about 24 or so typical peers. She receives push-in classroom support from her resource teacher for 30 minutes per day (typically during literacy centers and writing) and 45 minutes of pull-out support to work 1:1 on her IEP goals. 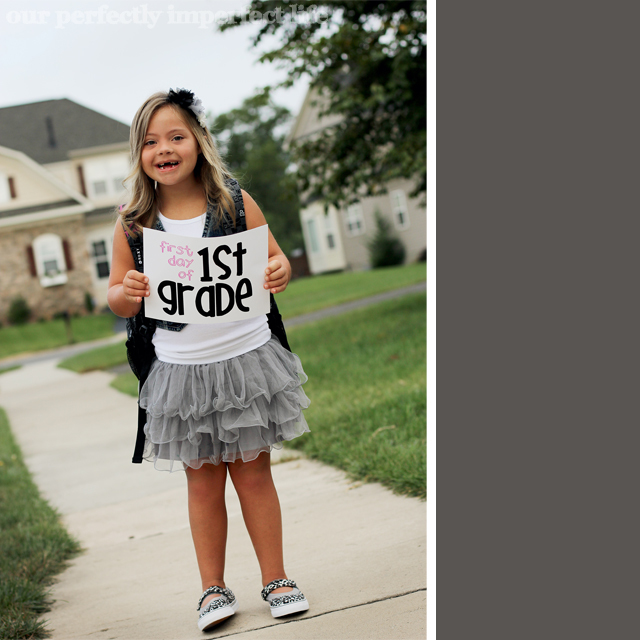 She also will be getting speech and occupational therapy at school, but I have not received the specifics of that yet. I was up at the school yesterday morning helping unload buses and I peeked in Nika's classroom before I left the school... this was within the first 10-15 minutes of the school day. Most every kid in the class was sitting in their chair coloring, while their teacher calmed a distraught child. Nika, however, was sitting on the floor right behind her chair. I had to laugh and went in to help, because I am pretty sure it is not on Nika's radar that she even has her own seat to sit in. Until she is physically shown the routine of her classroom, it will take her a minute to get comfortable. No worries here... she will get it. A note about her day... We have been focusing on classroom routines and schedules in class. She seems very confident, happy, and interested in participating in the classroom activities. She enjoyed interacting with her peers on the playground at recess and was very independent at lunch. Short term goals to work on... Getting classroom routines down, staying in her carpet seat, keeping hands to herself and stay with the class during hall movement. We have a daily behavior and goal chart that we use... more on that later. So we will see... praying she succeeds like I know she can. And Payton... she started 1st grade. Payton has been so excited to start school... as in, we had to refrain from saying the word school or she would run, get her backpack and proceed to beg to go to school. She loves it and I am really excited about her placement and the support she is getting. Her placement... Payton is in a 1st grade classroom in general education with about 24 or so typical peers. She receives push-in classroom support from her resource teacher for 40 minutes per day (typically during morning routine, literacy centers and writing) and 60 minutes of pull-out support to work 1:1 on her IEP goals. She also will be getting speech at school, but I have not received the specifics of that yet. A couple notes about her day... Payton has had a successful first day. She has seemed happy and eager to attempt classroom activities. She has done a great job of demonstrating classroom routines that she learned last year, such as unpacking independently, going through the lunch line to buy milk, and being a good role model in the hallway. We have focused on classroom routines and behavior expectations in class today. Payton has done tremendously! We will continue to practice classroom routines, etc. but I couldn't be happier with her progress already. If I am being honest, there is one teeny weeny thing that makes my stomach churn and that is worrying about peer relationships. While Payton is very much loved at school... and so many of the kids totally get her... some do not. And 1st grade-mean-girl-syndrome is nasty... we experienced it already at orientation. I cried the ugly cry that night... and moved on, knowing that those very people are not who we need to focus on... it is those that accept her for who she is. Here is the thing... Payton may not care, but she knows when someone is treating her differently, or purposely trying to evade her. And for this momma to watch that happen... it ain't pretty. I am trying to get a buddy program implemented at our school... if you have one at your school, could you provide suggestions on how it works? As a whole... super excited about this year for Payton. She grew so much last year in kindergarten and I know she will this year too. And big brother Mason... started 3rd grade. Poor Mason still had wet hair. I know this is so cliche, and quite possibly I say this all the time... but how have we possibly arrived at the day that Mason has started 3rd grade? It seriously boggles my mind and makes me a little sad. I am so proud of this kid and sometimes I think I put too much pressure on him, especially when it comes to his sisters... yet he prevails every time. He has an amazing teacher this year and I am hoping that his desire to be the center of attention in class fades a bit. Ha. Right along side that... I know his compassion for others remains. And reading and writing... we are going to work hard on that to keep him on grade level. His favorite subject at school... recess. His least favorite subject at school... math. This cracks me up... clearly he is not yet beyond the age where recess is the favorite. And his least favorite subject just so happens to be the one he excels in. Crazy kid. 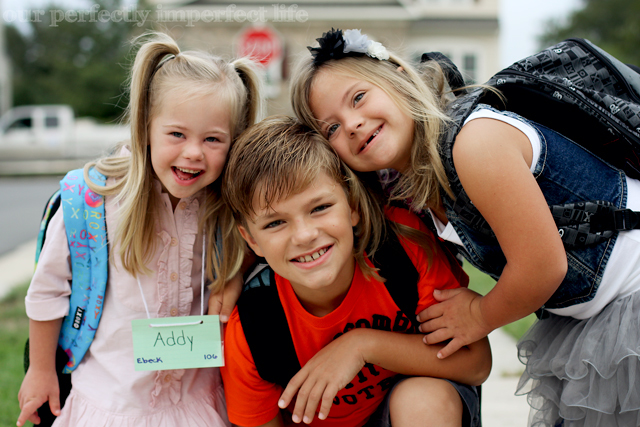 When I look at these pictures of the kids loading the bus... my heart just swells. To most it looks like a typical picture of kids getting on a bus... but to me, this shows Mason taking his sisters under his wing. Oh how thankful I am for him to be their big brother... and to know he is there with them. Whether he is more interested in his own friends at this point... let's just pretend he is always watching out for the girls. glad everyone is doing great, and of course it cant be in other way since they have a great mom, working with them, fighting and speaking for them, cant wait to see how much they will grow and learn this year. Yes! Ali, for you, I'm trying to promise to blog more. I hate when I get behind, but it always happens in the summer. I know right! Honestly I think I got it all out of my system the other night during the ugly cry. lol. You are too sweet... let's do coffee!!! That's just awesome Bethany!! Sounds like they are all off to a great start! So cool to read about the girl's placement. I hope we can have something like that for Bennett one day. I know what you mean about 1st grade girls, ugh! I don't like it when Ainsley (2nd grade now) has come home telling me about what someone did so I can only imagine when it involves Payton. I just hate how kids can be so mean. Hopefully those girls will see others treating her nicely and accepting her and will change their ways. oops.. forgot to add that your kids are beautiful! I love their "first day of school" looks! Bethany.....your children are so very beautiful! I love your photos. They are always stunnning. I too think of what Nika's life would have been like if she had not been adopted. It is totally heartbreaking to think of how many amazing children with ds end up in mental institutions and never get adopted:( Nika has so many wonderful opportunities now that she is living in the USA and has such an amazing, loving family:) Nika is very lucky and I know you are very, very lucky to have 3 such incredible children. School is here. Summer is over.